Children should not be given fruit juice before they are 1 year old unless it's advised by a doctor, according to new guidelines from the American Academy of Pediatrics, published Monday in the journal Pediatrics. "We couldn't really see any reason why juice was still part of the potential recommendation for 6- to 12-month-old kids," said Dr. Steven A. Abrams, chairman of the Department of Pediatrics at the Dell Medical School at the University of Texas, and co-author of the policy statement. "We recommend breastfeeding or formula in that age group, and there really isn't any need or beneficial role for juice, so we kind of made that adjustment." It is the first change to the academy's fruit juice recommendations since 2001. It wasn't "some magical new science" that inspired the alteration, noted Abrams, but rather "this (guideline) hadn't been looked at in a long time, so we thought it was time to take a close look." "The problem is, parents will stick a bottle or sippy cup in the kid's mouth and kind of leave it there all day. That's not good from the calorie-intake perspective, and it's sure not good for the teeth," Abrams said. "What happens is, the kid then gets used to all the sugar, and then they won't drink water." For children between 4 and 6, fruit juice should be restricted to 4 to 6 ounces daily. Children between 7 and 18 years old should have no more than 8 ounces (or 1 cup) of juice a day, making up one of the recommended daily 2 to 2 cups of fruit. The academy also strongly discourages unpasteurized juice products and says grapefruit juice should not be served to children taking certain medications -- ibuprofen, flurbiprofen, warfarin, phenytoin, fluvastatin and amitriptyline -- because it interferes with their effects. "We primarily are supporting that kids learn how to eat fruit rather than fruit juice," Abrams said. "I think that comes across more strongly than it has before." Atlanta pediatrician Dr. Jennifer Shu, who says the new recommendations are "great," agrees with this particular advice. "Even though it's natural sweetness, (juice) doesn't have the same benefits as real fruit, because the fruit has fiber to be more filling, whereas juice is just easy to drink and overdo," said Shu, who did not contribute to the new recommendations. Sharon Zarabi, a nutritionist at Lenox Hill Hospital in New York City, said that "with my experience of working with obese adults, we tend to see that what people eat when they're younger is what sticks with them as they get older." "When you isolate fruit into a liquid form, you're mostly getting sugar water, and it's easy to consume excess calories in liquid form, and those calories can add up, and they're void of any protein or fiber, which is usually what helps keep people satiated," Zarabi said. She recommends eating whole fruit for vitamins instead. Shu, who agrees with limiting juice in children's diets, said it's sometimes beneficial. "In general, the time that I tend to recommend juice is if kids have constipation, and apple juice and prune juice can sometimes help with that," she said. "I do think there has been a lot of education in press about juice needing to be consumed in moderation," Shu said. "We do try to encourage parents to think about juice as a sweet, just as you would soda." 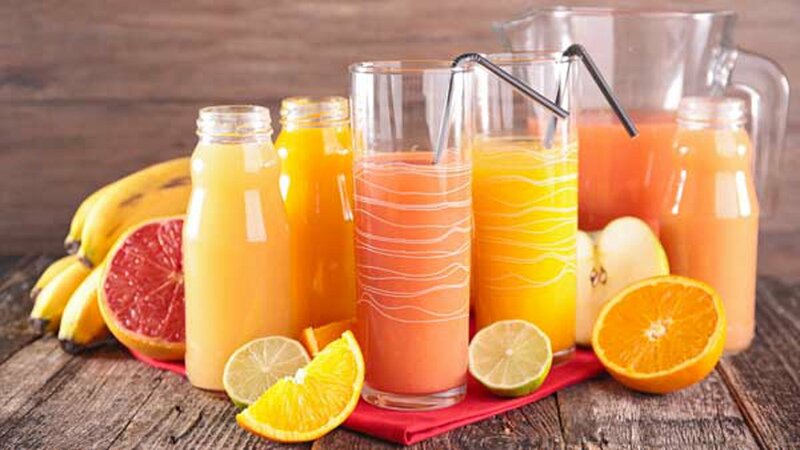 "Some juices naturally have certain vitamins or minerals in them," Abrams said, noting that orange juice has lots of vitamin C. "But that doesn't mean that apple juice doesn't provide vitamin C, because it's usually fortified." Shu advises, "If you're going to go for 'better' juice, in addition to looking for 100% fruit juice, look for calcium and vitamin D supplementation." This is especially good for kids who have a dairy intolerance or don't like to drink milk. "In moderation, it's never 'there's just one good food or perfect food or one bad food you have to avoid.' You have to know juice's place in the healthy diet," Shu said. "We prefer simply to let parents make their own decision about that," Abrams said, "and just focus on limiting the total amount of juice."